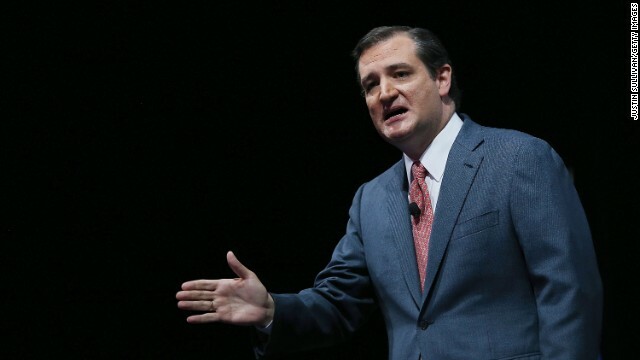 (CNN) – President Barack Obama’s suggestion that state “Stand your Ground” laws should be examined after the fatal shooting of Trayvon Martin could amount to an assault on the right of Americans to own guns, Sen. Ted Cruz said in Iowa Friday. Speaking after addressing a Republican group, Cruz told reporters he hadn’t yet watched Obama’s remarks. But when asked to respond to Obama’s call for a review of laws in individual states, Cruz responded by saying the president was trampling on constitutionally guaranteed rights. For example, Cruz said the Obama administration was violating free speech guarantees by “restricting the rights of our servicemen and women to share their faith and not be gagged,” and that the use of drones raised other constitutional questions. Obama on Friday made his first public comments about the acquittal of George Zimmerman last week in Martin’s shooting death in 2012. In his speech, Obama called for reconsideration of “Stand your Ground” self-defense laws in Florida and other states. “I think it would be useful for us to examine some state and local laws to see if they are designed in such a way that they may encourage the kinds of altercations and confrontations and tragedies that we saw in the Florida case, rather than diffuse potential altercations,” Obama said. The real issue is that not everyone can afford a gun. Maybe if they gave a gun to everyone this would just sort its way out in a Darwinian sort of way. Survival of the quickest. Obama is a mindless idiot ....fun to watch you libbies try and avoid that fact. "Cruz told reporters he hadn’t yet watched Obama’s remarks"
It didn't stop him from commenting on them. I also agree with President Obama when he asked what would have happened if Trayvon was of age and carrying a weapon with a CHL and he responded to this hulk approaching him and shot him? Well, esteemed right wing swifities, what of it?! It also points out what a great piece of neighborhood watch security guy Zimmerman was if this little guy, by comparison, could take him down and beat on him. Do you want that guy watching your back? I think not. Fact is, President Obama never mentioned guns in his comments. Fact is, Republicans are dedicated to relating everything he says to guns or healthcare. Let's admit we have a problem when a law allows fatal response to emotional cues. Put on your thinking caps, folks. Cruz is stoking paranoia. No one has had any guns taken away, even if the laws proposed were passed – and they haven't been passed. The fear keeps getting amped up, the guns and ammunition keep flying off of the shelves. It's your money... but it's a little crazy. I have the guns I want, I don't buy more to keep the ones I have – it just doesn't make sense. The 2nd Amendment rights should not be the focus of this conversation. Zimmerman pursued Martin even though he was instructed by the police dispatcher to disengage and no obvious or imminent danger existed outside of this pursuit. Zimmerman clearly pursued this kid because of his skin color and violated his civil rights under the guise of SYG. The NRA will lose ground by attaching its name to this case and should keep its nose out. Cruz IS stroking paranoia and our media wouldn't have it any other way. Indeed. The media eggs these fools on. let us know what part of texas represents so we can avoid it. I once thought that George Bush was the dumbest president ever but now I have to throw that honor to Obama. He doesnt have a clue about anything and it is increasingly apparent that he is also a racist. Cruz is paranoid but Obamas comments are clearly political since Stand Your Ground had nothing to do with the defense. fact is: stand your ground was never a factor in the Trayvon case. Obama is trying to mislead people yet again. I am so sick of his lies, he just can't seem to ever tell the truth. "Always know your target and what lies beyond it". Seems to be that since Cruz had not watched Obama's remarks, he knows neither and just pulled the trigger. So if Obama declares tomorrow to be National Pie Eating Day......that means he's going after the guns too, right ? Senator John McCain described Cruz as a "Wacko Bird"..Enough said. Texas owes the nation an apology for all the RW extremists and nincompoops that it has sent to Washington. While am at it, no more Bushes!!! Jeb, stay home in 2016. Ditto for Cruz. Watching Cruz lie like a dog just today was very instructive. Seems wingers will back anyone. The jury's instructions were based completely on Stand Your Ground. Can you patriots keep anything straight? ?